Godrej Appliances has announced a new product, a gaming TV with Motion Sensing Technology targeting kids and young adults. Called the Game LCD TV, it is built on the lines of a Playstation and XBox 360 and is pre-loaded with 25 games. 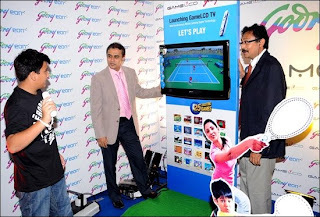 Priced at Rs 40,000, Game LCD TV is being test marketed in Kolkata initially, followed by a test run in Andhra Pradesh, Karnataka and Maharashtra. Godrej plans to officially roll-out the gaming product across the country by 2011. Providing further information, Kamal Nandi, vice president, sales and marketing, Godrej Appliances said, "The combination of advanced interface and engaging game play with motion sensing broadens our appeal to all members of the family. The main difference is that there is no separate device required and the product has all the normal features of an LCD TV." Nice gadget!! I´d like to give it to my son as a gift, becouse he loves all that games! We have have a tv lcd of 19 inches. Will it work with the device? ?